This entry was posted in Childhood, Marriage, Travel, Yeah Write and tagged Vegas wedding by Michigan Left. Bookmark the permalink. Awwww. And that’s all that matters. I think a vegas quickie wedding sounds awesome! I cannot recommend it enough. We had the time of our lives. I’m going to need a lot more pictures of this chapter. Like a ton more. I love the pic you did post. And holla! Bucktown. We claim that’s our neighborhood, but honestly, we aren’t that cool. We are just a few ghetto blocks, but still. anyway, more about you. I love this line: Or at least it looked better than a bunch of my parents’ friends doing the chicken dance under a disco ball. LOVE THIS! Happy, light, fresh, well written, and so very you. Thanks, Christie. My posts have been pretty heavy lately, but I’m feeling lighter now. I guess it’s showing. If I could do it all over again, I would choose something like this. Tip of my hat to you, Brunette Barbie. Haha! Thanks, Shannon. We had such a blast. The only bummer was that I never got all those cool gifts you get when you have an actual wedding and register for stuff. Oh, well. I loved my stewardess Barbie and that plane play set! It’s so funny what we “know” we want or think will happen to us when we’re younger. I was the complete opposite of you: I always thought I’d be married with kids in my early 20s, just like my parents, and I wanted a big church wedding. Well, at least we’re both living happily ever after. Happy anniversary! Here’s to happily ever after, Bee. It’s underrated. Oh, you are so inspiring me to think about and maybe write about my “how we met” story. I just love all your posts on this. I have kind of an opposite trajectory here though. I was your typical hopeless romantic who wanted nothing more than to find my partner and have babies. Instead I had a career in the arts and traveled and dated too much and then finally met and married my husband in my 30s. Funny how we surprise ourselves. It sure is funny. Sometimes we don’t expect to end up where we do but find ourselves awfully happy we did. I hope you will write your “how we met” story. I would love to read it. How fun! 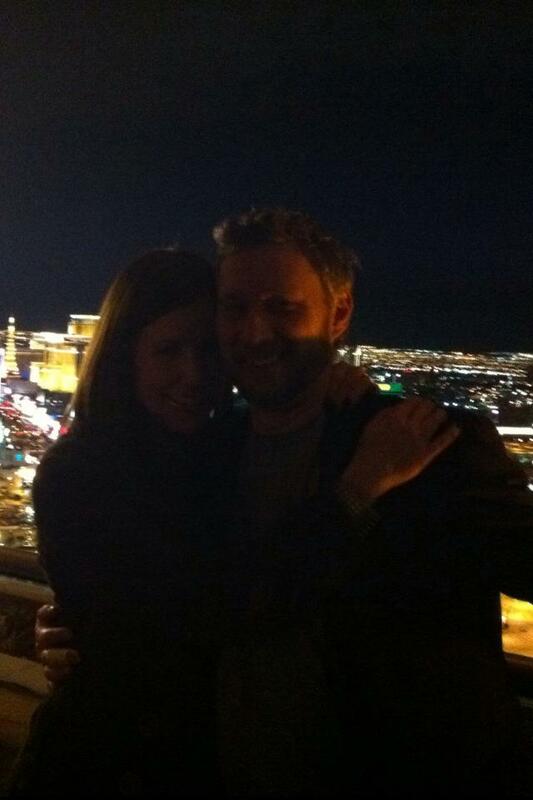 It’s so neat that you were able to go back to Vegas for your 15th anniversary! Thanks, Ginny. It was a great anniversary. Our kids came along but stayed with Grandma and Grandpa for a few days so we could celebrate on The Strip. Aw, what a sweet story, I just loved it! I’m glad you did it your way. Also happy you got to take your kids to Europe. We are hoping to take ours next summer (although I’ve been many times since I used to work for a Swiss company!). Thanks, Stacie. We spent two weeks in Italy, and we are all dying to go back. Next on our list is the UK. I’m glad Brunette Barbie found her co-pilot. What lovely and touching proof that the quality of any celebration, and especially a wedding, is defined by the participants. The surroundings, even when at their very best, can only enhance the experience. I’d have loved being a guest at your bash! It was such a great night. We had longtime friends come in from all over the place. So lucky to have them all there with us. This is such a sweet post! I can relate in the fact that I never dreamed of a big wedding or a wedding at all really, but I did dream of the end result: a family. It so nice to know that our childhood dreams did come true, even if it is an unexpected way. (aka, I had a baby first, then got married a few years later!) Happy anniversary! Thanks, Laura. I guess it doesn’t matter which order the happiness comes in, does it? As long as it comes. Even in the dark photo I feel the love between you and your husband. Such a sweet well-written story. The Vegas wedding sounds like the right choice. I had the big wedding with the white dress. It was wonderful, but stressful, and if I had it to do over again I would do what you did. It just makes sense. Thanks, Emma. It sounds like you had a lovely wedding, though, and at the time I’m guessing it was the right choice for you. I LOVE this!!!!! I had the whole big church wedding, St. Clement in Lincoln Park, when all I wanted was a quiet affair. You pulled it off with friends and family too! I was never into Blond Barbie either. She was too Stepfordish. I wanted excitement and travel and all those things. Looking back, you nailed it when you said “she” did all those things but the order changed. I feel that way too and also that it’s the way things were supposed to be. You, me and Christie need to meet in the city after the holidays!!! I would love to get together with you ladies. Let’s plan it!!! Congrats! Isn’t it funny how we never seem to end up where we planned to be? Thanks, Lindsey. It keeps life interesting, for sure. I mean Foundation! You had Chicago in my head! Ha ha! Oh, that’s too funny! I didn’t even remember the right name (Foundation) until you said it. We’re music folks but not big clubbers anymore. I think we stayed there for all of an hour. The view was spectacular, though. Sounds like a wonderful romance. Thanks, Michelle. It’s fun to look back at where we’ve been as we plan where we’ll be next.